Mini Sudoku Puzzles play a very important role in Sudoku creation and Sudoku solving. 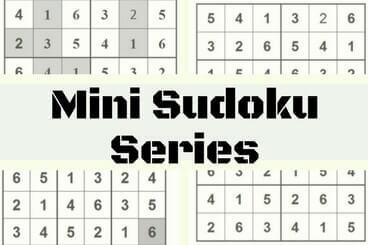 These Mini Sudoku can act as an example to the bigger size Sudoku puzzle. Sometime I create a mini puzzles to understand and practice new Sudoku variation which is going to appear in the forthcoming championships. Also Mini Sudoku helps to publish new Sudoku idea very fast as one can create a Mini Sudoku with an New Sudoku Variation idea. Mini Sudoku puzzles can also be used a training puzzles for Kids and for the people who are new to Sudoku solving. I have been creating many Mini 6x6 Sudoku puzzles for training of kids. I will be publishing all these puzzles under this Mini Sudoku Series. One can find bigger size Sudoku published under The League of Extraordinary Ladies and Gentlemen and Fun With Sudoku League. Following are the Mini Sudoku puzzles published on this blog.